Dingo® TX 525 wide-track and TX 525 narrow-track diesel units are bio-diesel compatible for blends up to B20, which represents a mixture of 20 percent bio-diesel and 80 percent diesel fuel. 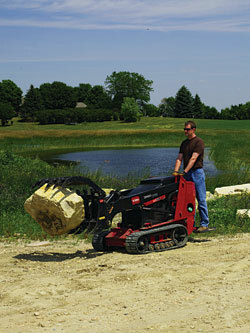 The utility loaders feature a 25-horsepower engine and deliver added torque and hydraulic flow. The units are designed for constructing landscape features, demolishing interior structures, installing irrigation systems, preparing seedbeds, hauling and handling material, building decks and fences, planting trees, and building ponds.